Is Toshiba Satellite C55-B5298 16-inch Laptop Just Usable? Home » Toshiba » Is Toshiba Satellite C55-B5298 16-inch Laptop Just Usable? The very con of this Toshiba Satellite C55-B5298 to me is the keyboard, which is a little bit more to the left because of its configuration, it has numpad, but you will need time to get used to. It’s still manageable, but it’s a little bit difficult to type at first. Aside from that, been messing around with this laptop for a week, and there is not too much to complain about it. Not the fastest, or the prettiest laptop, but it’s decently fast for my daily computing stuff like internet, MS Office, and streaming YouTube videos. I seriously needed a new laptop but I couldn’t pay more than $400 bucks, found cheapest here, that’s the main reason why I needed to buy a laptop at this price range. I compared this laptop to a Dell laptop and newly released Chromebooks, and this wins on the 3 USB ports, and more HDD space. This Toshiba Satellite C55-B5298 laptop comes with a 15.6″ display which is a matte not glossy, and from a student’s perspective, the screen is perfect to have a few applications opened at once. It has decent resolution, there isn’t any problems reading the text on the web. Note, the display isn’t touchscreen. Toshiba Satellite C55-B5298 16-inch Laptop display. Compared with a Chromebook (I have used Chromebook in the last 2 years), it’s obviously heavier, weighing at around 5 pounds, you will still be able to carry it in your backpack. It runs Windows 8.1 64-bit out of the box, so you can always use your programs and working with your data, even if you don’t have access to the internet. The DVD drive is indeed not included in this Toshiba C55-B5298. This means you can’t watch DVD in this laptop, but it’s not a big deal for me, if I want to watch DVD I watch it with my TV, and these days, most programs have downloadable installer in their websites. However, you still can use external DVD drive if you feel you really need it. I have 4-5 hours battery life with intensive use on it, so the battery laptop of this laptop is pretty good. For gaming, out of curiousily I tried World of Warcraft, even though it was playable, but it lagged a bit, so if you are heavy gamer, this is not for you. For lighter games, like Mass Effect or Sims 3, this laptop can play them just fine. 6. Wifi, Bluetooth, and ethernet. Check the drivers update if you have this laptop. 7. Webcam, built-in mic, and a jack. 8. 4GB RAM, upgradeable to 8GB. How to upgrade the RAM? You shouldn’t do it if you are in doubt. 1. From your laptop’s bottom part, remove all screws. 2. Slide the laptop’s battery and the plate away from the laptop. 3. Gently pull the bottom cover off from your laptop. 4. You will see only one RAM slot, replace the old one with 8GB module that should be CL 11, 1.35 v, and PC3-128. Do I recommend this laptop? If you are student and your school uses only Chrome, then get a Chromebook. However, if you still have a choice, you can consider this laptop. For under $250 or less here, you are going to get a full feature laptop that does all the stuff a Chromebook does and can do more. 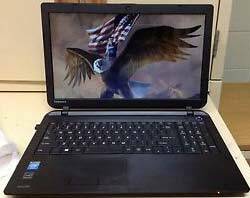 I want to know how to install windows 7 in Toshiba Satellite C55-B5298 15.6″ Notebook Computer. Can external optical disc drive do the job? How to change boot sequence priority to external disc drive?